It’s spring time in the Rocky Mountains and it’s time to make some marmalade. I almost always start my canning season making Pepper Jelly for the holidays but the rhubarb was so beautiful this spring, I’m forced to veer off course and make some mouth-watering, sweet-tart Rhubarb Kiwi Marmalade. While I was at it, I decided to make some Pineapple Mango Marmalade. Both turned out a smashing success. 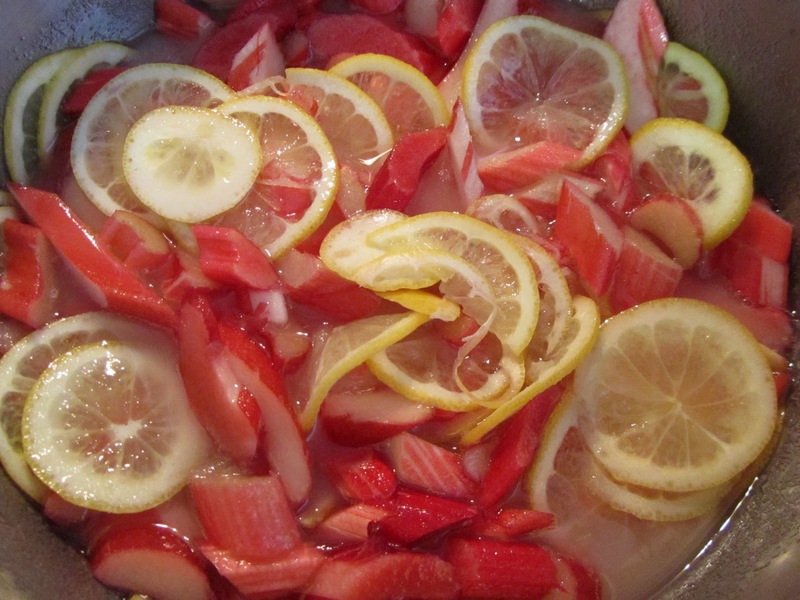 Wash rhubarb and chop into small pieces, slice lemons thinly on a mandolin leaving peel on, remove skin from kiwi and slice thinly on mandolin, add fruit to large heavy stockpot and set temperature to medium high, add sugar and 1/2 cup water and bring to a boil. Lower heat to medium keeping the liquid at a medium boil. Cook until fruit is clear, about 45 minutes to 1 hour, stirring frequently. Remove from heat, add liquid pectin and skim any foam. Process in sterilized jars for 15 minutes hot water bath. Hot Water Bath: in a large stockpot add enough water to submerge filled sealed jars, boil filled jars on medium high heat for 10-15 minutes, remove to a dry towel. Jars will make a distinctive “ping” sound when they’ve sealed correctly. I got a little carried away adding water to my recipe resulting in a soppy marmalade. I added another packet of liquid pectin and a few more lemons to thicken my recipe and luckily, the marmalade set up perfectly. Dried fruit can also be added as a thickening agent instead of using liquid pectin. To make a conserve just add a cup of chopped nuts to the mix. Peel and chop pineapple and mango, Using a large heavy bottom sauce pan heat fruit on medium high heat, add sugar, lemon zest and juice. Cook for 10 minutes, add water if mixture is too thick to stir. Bring to a rapid boil, cook 2 minutes, reduce heat to medium and cook till fruit is clear about 40 minutes. Process in a 15 minute water bath in sterilized jars. Spread on an English muffin or piece of fresh French bread and prepare to be dazzled by the flavor. Thanks Beth, the combination of flavors is really yummy! Enjoy the recipe and thanks for visiting! It’s easy, fast and fun. We would love that you participate with some recipe. Hi Anna, I’m thrilled you made the Rhubarb Jam with your husband and it turned out so well! Sorry about the brown yellow color! I know it can be difficult to find really beautiful rhubarb. I often times will add a bit of red food coloring if the rhubarb is green. Thanks for trying out my recipe, you’ve made my day!! Measuring Flowers and Mommy, Thanks you so much for visiting and following my blog! This blog hop has been the best!I look forward to spending time on your blogs and getting to know you both better!! Thank you for swinging by 2 Against 1 and linking up to the TGIF blog hop (Friday). Hope to see you again next week! Following back now. New follower from the hop. Have a great day! Biren, Homemade is always better, it just takes a little more time but it’s filled with love! scrambled, I hope you get the chance to purchase some rhubarb that was as nice as the rhubarb I found in the local market. Let me know if you do and if you post a recipe!! I can always use a new rhubarb recipe! Becca, yes our names are just beautiful! lol!! I’ll be following Becca’s Perspectives too!! I can’t wait to see what your perspectives and blog area all about..
Jade, I’m all about great giveaways…I’ll be following you and checking out your latest and greatest. kf, as always, I adore you!! Do you think rhubarb would travel well to Malaysia??? hugs!! Hi Rebecka, both your marmalades looks beautiful and super delicious! I can never find rhubarb over here, I’m still looking for it. Thank you again for sharing yet another delicious canning recipes! wow! Your marmalades look awesome! Nice blog you have here! Following you from The Middle Matters blog hop! Hope you could follow back Pinay in Texas Cooking Corner. Thanks! Enjoy the rest of the day! o.o they look so pretty AND tasty! Newest follower from the Middle Matters Blog Hop! Thanks for following Just Wedeminute and the Middle Matters Blog hop. I’m following you back. These both look so mouth watering, I want to go make some right now! And don’t forget to check our new Blog Tutorial going on today. It’s really easy and it would look amazing on your blog, so make sure you don’t miss it. See you there! Gorgeous pictures. By the way, you have a wonderful name! Your marmalades look wonderful! The only jam I’ve ever made is strawberry jam. Homemade is so much better than store bought.